Sturdy Pocket USA Instruction Card! 4x6 Coated USA Chaplet Instruction card. Please also feel free to print them right from here for free! This will just be short updates to let you know about inventory, specials, sales, closeouts and stock I've recently received. As far as the closeout stuff goes, more than likely, once it's gone, it's gone! Please Note: If you are ordering more than one of the SAME item, it would be a good idea to email me first and ask about availability; parts may have to be ordered, as I am one person and do not have a lot of stock on hand. The beads shown on the DESIGN IDEAS page do not always reflect the current market price. If you request a duplicate of something on that page (rather than the already made rosary pages with the purchase buttons) I will have to quote you a price that will reflect the current market value of the beads and, in many cases, will be more than what is shown there. The prices shown there are for the beads that were used in the original item and are shown only to give you a ball park figure. March 24, 2019 - SORRY, BUT ONLY SHIPPING TO CONTINENTAL USA! Friday, December 2, 2016 - Hi Folks ... just a quick little note about the beads. :) I won't be taking any special orders for a while until my health improves and I feel a little better about Carl's passing on September 1st. I will try to fill the empty spaces on the website best I can; but where I've been spending more time IN bed than out lately, not sure how fast that will be. Thank you for your understanding and prayers. Blessings! Wednesday, April 20, 2016 - It's sure been a WHILE again! Guess how these things are all going to start for a while! Didn't realize I missed a WHOLE YEAR though!!!! LOL .. Well ... I've been down more than up since the beginning of the year between the arthritis, rotator cuff a few more fun things and now pneumonia. I had it for a while before I gave in, but my PCP came on 3/16 and had me walk a bit. My Oxygen went down to 50 something, so she said no getting around it anymore ... and called rescue to take me to the ER. So laid there for hours getting IV antibiotics and fluids and they sent me home with a script for a z-pack and 24/7 oxygen. Thought I was doing pretty well till a few days ago, but it's making another visit apparently. PCP just here a little while ago and advised to take another course of z-pack and nebulizer 4x/day. Course she didn't have an ex-ray machine with her, but after listening to my lungs, it was easy for her to determine the junk was building up again. So very knocked out and lethargic, but trying to get things done. I nearly flipped a week after the hospital with what I got in the mail. Over 2 grand for the ER and even though it was medically necessary to go home in an ambulance due to the fact that I needed oxygen, I got a bill for over a grand for the 9 mile ride. So .... ain't no fun getting old! LOL Anyway, appreciate extra prayers if you've a mind to; thanks. And by the way.... If you DO have a mind to pray for others, just as I have monthly Masses said for the customers of BattleBeads, I've made a FaceBook page for the BattleBeads Prayer Warriors which will also share in monthly Masses. Just join or "LIKE" the page to join us! You can go there to see who needs prayers and pray; but if you can't make it once in a while, God knows who's on the page and who needs what, so you can simply include the BattleBeads Prayer Warriors intentions in your daily prayers. Easy enough, huh? So, in closing, I will do my best to get to everything as soon as I can and I thank you for your patience. The folks that have been waiting really long will also receive a little 'thank you' with their orders! Blessings and please pray for me and my caregiver, Carl who also now has pneumonia as well and was in the hospital for a few days with it, but home now. Please pray that his pancreatic cancer is totally gone and never returns ... God's Will be done in all. Thanks! 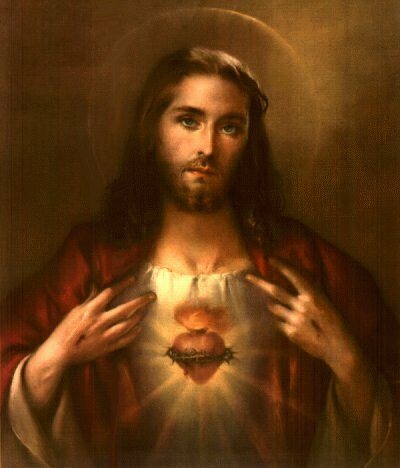 Let's all pray that 2014 holds some GOOD CHANGE for a 'change' and that we all stay in the Divine Will of the Trinity as we wait in joyful hope for the coming of our Savior! Saturday, November 17, 2012 - I finally received the olive wood beads from Jerusalem! They are VA VA VA VOOM GORGEOUS! :) Well worth waiting for! I'll be ordering more from this source for sure! The initial order will only provide for about a dozen rosaries, so if you're at all interested, let me know. I have some beautiful olive wood centers and Crucifixes to go with them too if you want a complete 'look' :) I have an abundance of black onyx and hematite semi precious stones that are itching to be turned into someone's family heirloom rosary! Don't forget, BattleBeads isn't just silver and gold plated ... it's also Sterling Silver, Gold & Silver Filled, Bronze, Brass, Copper, Crystal, Pearls so much more! Christmas is coming ... let's design that perfect gift together! :) And, if it says STERLING SILVER from BattleBeads, you can be CERTAIN that EVERY SINGLE PART IS STERLING, not just the Crucifix and center, like many other sellers!!!! Tuesday, October 23, 2012 - WOW! I guess time slipped away from me again! LOL .. Seems to do that the older ya get! I keep telling folks NOT to get OLD, but NO ONE EVER LISTENS TO ME! ;) Anyway ... I wanted to let you know that I'll be making a STAINLESS STEEL ORDER here in a week or two. So please have a look at this gorgeous stuff if you have any interest at all. This stainless steel is absolutely WONDERFUL and high quality (or I wouldn't be offering it to you at all!). The only problem with it is that I must order a substantial minimum amount to get just one item; so I have to kind of make good selections when I order, which I apparenlty did NOT do the first time. I can't imagine why it hasn't sold, it's breathtaking and the price is surely RIGHT on it! :) Anyway, please have a look on the stainless page and if there's anything you didn't see, just ask me. They offer earrings, pendants and all kinds of things. I will order some earrings this time around to show you. I also am expecting a rather large shipment of OLIVE WOOD BEADS FROM JERUSALEM. These beads are going to be wonderful for rosaries, chaplets and anything really ... they're very high quality and will work well on either cord or chain. I also have a lot of regular wood beads and semi-precious hematite, jaspers, onyx and much more just waiting to be turned into your favorite items! Friday, December 2, 2011 - I think I need to update a little more! LOL I have MOUNTAINS of beads in stock .. lottsa hematite, jaspers, Czech druks and crystal, Swarovski Crystals, Preciosa Crystal, glass pearls, cultured pearls, lapis .. gosh .. and so much more .. just ask if you don't see something, I likely have it. If not, I can sure get it :) I added a little blurb about the differet kinds of rosaries available in the ABOUT ME section. I will be glad to make any style you wish. I'll paste it here as well for your convenience. Chain Link: This rosary pools easily (gathers into a small pile) when lowered in your hand and is constructed by chain linking beads on wire, using jump rings and chain. Likely the more traditional and easily recognizable rosary that most are used to seeing. You will see a little loop between the beads. Corded: This rosary has the beads strung on cord with special knots. There may be knots between each bead or a decade may slide to the Pater. This too will pool in your hand easily. Wire Wrapped: Very similar to the chain link, except that to end the link on the bead, the wire is wrapped around itself making a much stronger link. It may also be doubled back onto the bead for decorative purposes. It will also pool well though a bit stiffer than links. Flex Wire: This rosary will NOT pool well in your hands although it is somewhat flexible as the name implies. It is similar to corded except that a fine cable wire is used to string the beads with a 'spacer' bead in between each of the prayer beads. It will be one long continuous string of beads offset by different sizes .. you will see no spaces or links between the beads. It is secured using crimps with or without wire guards and crimp covers. Double crimping is best on these with a crimp cover for added security. A broken crimp will let ALL the beads fly where a loose link can easily be repaired. All in all, it's a matter of preference. Friday, September 30, 2011 - I have to say that I'm just LOVING this new sterling silver FILLED wire! With precious metals soaring through the roof of late, the quality of this is fantastic at a substancial savings from sterling and fine silver! SSF is the same as Gold Filled and is considered a lifetime product that wears like the real thing. I am VERY impressed with it and gave it the MARY TEST and didn't take it off for a week through even washing dishes and each time it came out of the suds it was more brilliant than before! I have found that unlike plated metals, you can actually hammer and shape this like solid sterling and gold without the core showing through, yep ... it's THAT tough! :) I am very proud to carry this fine new semi precious metal and as pleased as punch that I CAN recommend it so highly! I'll be using a lot of it in the casual jewelry. BTW ... regarding the warnings of malware on the website ... I have been in constant contact with my hosting company and the AVG anti virus company with sending files etc. back and forth for testing and so far nothing can be found (after that piece of code from Russia was removed). It's apprently only the Chrome browser that picks up anything at the moment, but we're still looking into things. But rest assured that all transactions are processed ON THE PAYPAL SITE and *NOT* on this site, so your purchases and information is VERY VERY SAFE AND SECURE! Another reason I really like PAYPAL .. that and because I never have to look at any personal info of my customers other than their address so I can sent their package! Monday, August 22, 2011 - Well ... it appears I'm not doing a very good job of putting the website news on the blog site! I just have a hard time doing business on that site, I kind of feel it's more for information on prayer and events in the world and things. SO ... I guess it will be back here and I'll try to get the widget working again so it can also be seen in a small area on the blog. There also hasn't been much activity on the website for quite a long while now, so there was really nothing to update. The only thing is that I have a pretty good supply of sterling and gold filled now along with copper and bronze and even the new silver filled wire, so I'm all fired up and ready to go! I guess there was some confusion with the left side bar navagation on the site and that's why I've just revamped it a bit with a top menu as well. I've also tried to make the blue bar stand out more with larger letters that actually say CLICK :) It seems Carmel is calling me ... I'll be praying more about that, but that's the reason for the color change anyway, if anyone was curious. I also have LOTS of 10mm ivory glass pearls, 8mm bronze glass pearls, 6&8mm Swarovski Crystalized white pearls and some fresh water left as well. The 3" Tibetan Silver St. Benedict Crucifixes are getting scarce and they're more costly now, so if you want one, now's the time to speak up! That's about it for now. God bless! Wednesday, January 12, 2011 - Several new bracelets, rosaries and other items have been added, including a brand new CONVERTABLE ROSARY! Pictures on the blog for your perusal, but suffice it to say that this rosary will convert to a pocket decade, auto rosary, full rosary with enough left over for a bracelet and necklace. A very versatile piece! But check out the Adornments page for the bracelets and on the chaplets page, you'll even find a new St. Therese Sacrifice Bracelet! God bless! Monday, November 1, 2010 - I'm pleased to say I'll now be making the "Life of Jesus" Bracelets. Truly a testimony of Faith for all Christians. The pattern will be followed, however the materials used will be in accord with current stock on hand. A better description may be found here. In honor of the Feast of the Holy Rosary, 20% off today only on all pre made rosaries on pages 1-4 .. MUST email and NOT use the buttons on the site to receive discount! Special orders, chaplets and unique pieces are not kept on hand so cannot be included. Wednesday, October 6, 2010 - Please say a prayer for the soul of my dear Father, George, today on what would have been his 92nd birthday. Please say a few extras for this ole rosary maker .. some additional health concerns have arrived ... more to offer up though, right? :) Anyway, I've been busy with medical appointments and getting a few special orders out. But the wheels are turning for new design ideas so check back often! Have also ordered more sterling components and want to offer also some vintage look bronze and brass pieces, so watch for those soon too. I ordered some really nice brass components yesterday, can't wait till they arrive! I am also anxiously awaiting for some Jobs Tears beads!! I've been seeing so much about them lately, I just had to get them when I happened across them at a decent price for a change :) But I only ordered a SMALL quantity, so first come, first served! 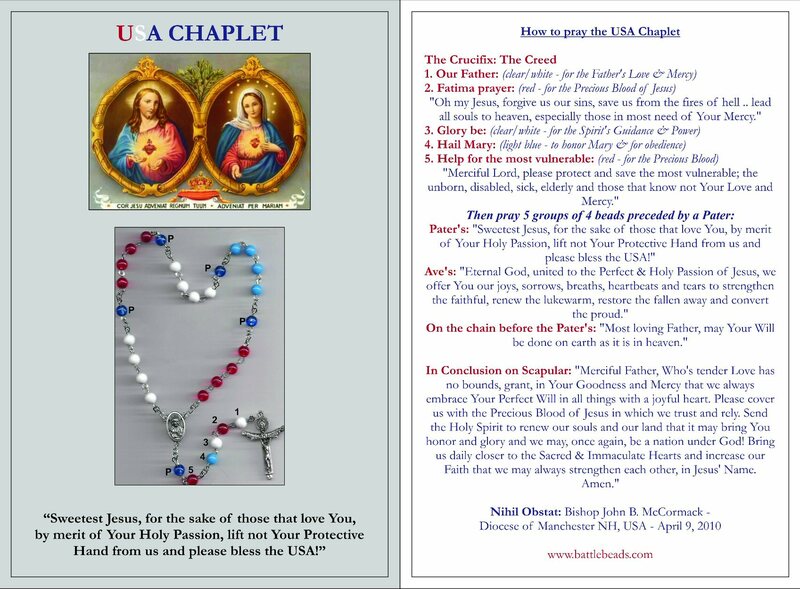 Please check with your parishes and dioceses to see if they would be wiling to help disseminate the USA Chaplet. It's been hard getting the word out and I need lots of help! The prayers, I believe, are very important for the time in which we live. No need to buy beads, but if anyone wants them, I offer a full chaplet starting at just $7.99 and a short version for just $4.99. But it's NOT NECESSARY to buy beads and I'd never be able to keep up with orders anyway! lol So just copy the instructions and pray the prayers! Instructions can be found here: http://www.battlebeads.com/usachap.html Perhaps your parish offices might print out some copies to leave in the back of the Church? Friday, July 30, 2010 - Very pleased to add the Brigittine Rosary (The SIX DECADE ROSARY) to the BattleBeads arsenal! This is truly a TREASURE of devotion! Click the link to read the description, a little history and very easy instructions! Can be made with any size beads. Prominent features are the extra long chain/decade spaces and the extra decade that results also in an extra Pater. 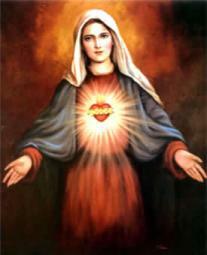 The 7 Pater's promote devotion to our Lady's 7 Sorrows as well as her 7 Joys .. just a TREASURE! Truly a marvelous addition to your prayer time! It can be found on the Unique and Unusual page and also here. Monday, July 12, 2010 - Several folks have suggested that I also offer regular jewelry. I have made a few pieces when folks have asked but this site is to promote prayer primarily. Still, I'm thinking here now that if I sell regular stuff, it would perhaps help me to buy better materials for the rosaries and offer even better quality items like sterling silver, pewter, gold filled, etc.. What do you think? The name for this popped up as "Simply Secular" lol I think I might try to make a few pieces and put them up. Please say a prayer that it's made clear if this is ok or not for me. Thanks! Tuesday, July 6, 2010 - Battlebeads has been featured in How-to-pray-the-rosary-everyday.com's "Rosary Promoter of the Month". Tuesday, June 22, 2010 - New Voil/cord necklaces with cloissoné crosses. These are very pretty and come with 2" extensions for a bit over 18" total length. Not sure how many of these will be available. Two are black with St. Benedict enamel Crucifixes. May be a limited edition item. Received the St. Michael medals and catching up on the USA Chaplets. Waiting for some nice glass pearls to arrive! Saturday, June 5, 2010 - Received 7 Sorrows & 5Wounds chaplet medal sets in. Need to order more St. Michael color medals. Cannot seem to get brown satin cord anymore, so only have black now. Do have beige, black and sable brown regular cord. If you're waiting for one of the newly approved full USA Chaplets, please be patient. You can still pray from the instruction sheet as you wait or perhaps might like to buy the shorter version with only one group, which is much faster to make and less expensive! Saturday, April 10, 2010 - Received a letter from my local Bishop, giving his Nihil Obstat, regarding the new USA Chaplet. I can now disseminate it to the faithful without reservation! PLEASE, copy the prayers and pray them ... I believe it's very important. Saturday, March 13, 2010 - I have received a few comments regarding my prices. I don't think many other folks that sell things are troubled with this, but apparently it's something that has concerned more than a few customers, so I will address it here. I am GLAD that you think my prices are low .. that's the way it's supposed to be! The aim in this ministry has always been to put prayer into the hands of folks that will PRAY - not to make a profit. More than 10% of every sale or donation is given to missions, the poor and to have Masses said for customers and those in need. If I make a special design or work with you on a project and you feel my price should be more, please feel free to use the donation button on most pages. :) Your extra gift will be put to good use. I often buy holy cards or speciality items to put in with orders when folks are having a particular hard time or just to say "thank you" for repeat orders. Sometimes your kind donation could be the difference in being able to take advantage of a special sale on these materials or on some nice beads, wire or related items that will enhance the designs shown here and give strength and hope to a soul in pain. Either way, you can be sure your kind donation will be put to good use along with extra prayers of thanks for your kind generosity! Friday, February 26, 2010 - Mother Teresa Express Novena Chaplet finished. Feel free to ask for any color or material for beads! Wednesday, February 17, 2010 - Added "Niner" Chaplets and the Chaplet of the 7 Dolors of our Lady, also known as 7 Sorrows and Servite Rosary. 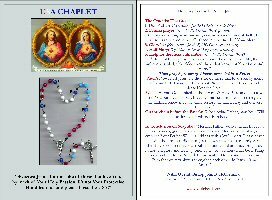 Sunday, January 17, 2010 - Chaplet of the USA finished and sent to Diocese and other interested persons/organizations for comments/approval. Details here. Friday, December 18, 2009 - Began offerfing monthly Masses for all customers! Friday, December 4, 2009 - Added: St. Therese Sacrifice Beads along with St. Therese Chaplet. Friday, November 27, 2009 - Received some very nice and inexpensive Rosary boxes/containers and sturdy stretchy Icon bracelets made from Brazilain wood which are very nice. Tuesday, November 24, 2009 - Got in some GORGEOUS Jablonex Crystal. This is the Czech answer to the Austrian Swarovski Crystals and VERY beautiful and a little less costly than the Swarovski. I have 8mm light Sapphire and the brilliance is just marvelous! Also have some millefiore beads, artisan glass and volcanic fossile glass. Many new things arrive all the time! Tuesday, November 17, 2009 - Anxiously awaiting the arrival of some JablonexÂ® Czech fire-polished glass .. it rivals Swarovski Crystal at an easier price! Monday, October 19, 2009 - Added: Handmade Mantillas (Chrocheted Chapel Veils) by Joy. Just $24.95 which includes S&H! Wednesday, October 7, 2009 - 24 Hour SALE!! 20% off every item 10/07/09 only! In honor of Our Lady of the Rosary. Sunday, September 27, 2009 - Added Prayer Candles by TRUSTIAM. A prayerful lady that makes Christian prayer candles using texture, color and scents from the bible! A long forgotten but WONDERFUL tradition that can only enhance your prayer life! Please have a look at her site at the link above, or a few samples here. Thursday, September 24, 2009 - Added "Peace Wheels". Small pocket decade on 1 inch circle. Ten wire wrapped Ave's surround a middle Pater which twirls giving a calming effect, similar to worry beads. Gemstones take on certain properties like calming and thwarting negative thoughts (some listed under BEADS in the About Me page). GREAT for quitting smoking or breaking bad habits. Have begun making earrings on the "Adornment" page! Saturday, September 19, 2009 - Never forget prayers for the Holy Father's intentions again with "Papa's Prayers"! A small addition to your center piece! Also the "Tree Decade". A stand up decade of the Rosary that sits on your table or desk. Fully adjustable with cross! Monday, September 14, 2009 - Sometimes very special things happen in a persons life. Today is such a day for me. I have received a FIRST CLASS RELIC of Blessed Francis Xavier Seelos, C.Ss.R. (1819-1867) ... I am very blessed and pleased to say that this relic will be touched to all Rosary Beads and chaplets that I make. Monday, September 7, 2009 - LABOR DAY SALE!! 20% off today only! Got in some wonderful Lapis Lazuli the other day (limited supply). The marbling is very beautiful on these beads and the veins are patterned very nicely. It works wonderfully with cobalt Paters and gold toned accents ... really a lovely rosary. Don't forget, if you see something you like that's been sold, just drop me a line and I'll come as close as I can to matching it up for ya! God Bless! Recently got in a bunch of Czech glass several different kinds; druk, faceted, rounds, crystals ... name your color! Many cat's eyes, cobalt, more jasper, some quartz and GORGEOUS Czech pressed and druk dark aqua and turquoise! Some aventurine is on the way, along with red sea coral, more onyx, jasper and some lapis lazuli, which I can't wait to get! Have about a dozen full color large pendants of Our Lady of Grace, Sacred Heart, Holy Family, Our Lady of Guadalupe, Christ Crucified, Divine Mercy and St. Jude. Not sure if I can get more of these, but will try they're nice for keychains or additions to larger rosaries. Have some nice cobalt! 6mm ovals and 8mm saucers great for rosaries, bracelets or necklaces. Also have some very nice Czech faceted tube beads(champagne) crystal ... some in (colors) cathedral style; VERY nice for Paters!